If you want to provide a user the possibility to select multiple values from a list then you normally have – in other programming languages – a control containing items an the possibiity to mark or unmark them. It’s called a listbox in Visual Basic for example. You eather choose items by holding CTRL key pressed or clicking the check box of the desired list items. In ABAP you do not have such a simple control; you must build your own. By clicking the checkbox the color of the line changes to green. You can also use the standard row selection of the SALV by marking the lines at the most left side of the SALV table. The user will then have to hold CTRL key to select more than one line. This is a bit problematic because if the user clicks somewehre else in the table the selection will get lost. All the above solutions – which really look quite cool, don’t they? – have one major disadvantage: The cost quite a lot amount of space. If selecting some options from a list is not part of a process step or if there is simply not enought place for showing this control than you use a dropdown menu. The main advantage of these lists is that you always can see all selected and not selected options. The disadvantage is that you cannot see all the selected options. You will have to click the menu to see which options are marked. This dropdown menu has another disadvantage: After hitting an option the menu disappears and you will have to click again. And this actually is the main reason for posting this: I had the idea to raise the dropdown-menu-clicked-event again after having selected an entry and rebuild the menu. The effect is that you can select an option, the menu entry will be changed to checked and right after the click the menu will be displayed again. The effect can be set by using the DISPATCH method. This code is a very good example to show how to build a general function that could be used in several different programs. You will have to add some methods so that a programmer can work with it (setting options, getting th results, placing the control in a given container, setting Icons and so) but I think it’s easy to imagine that such a tool can be very good re-used. With the given coding you can make the class customizable so that the programmer can set icons to be used, displaying titles etc. You could also use this mutliple selection control as a radio button alternative. 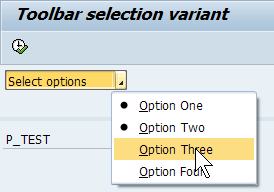 just make sure that after selecting an option the oter options are unselected. I could also imagine multiple states which iteratively will be set after clicking: Not only ON and OFF but GREEN, YELLOW, RED or MUST, SHOULD, CAN’T. Dealing with tables where the structure is unknown could also be a possible option. Just pass the table to the class and tell the class which field is the one to use for marking and which one is the text field to display. Using ASSIGN COMPONENT (fieldname_for_text) OF STRUCTURE … you can provide an easy way for selecting mutliple lines of any table. 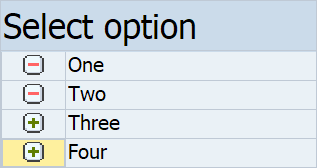 ty_options TYPE STANDARD TABLE OF ty_option with DEFAULT KEY. 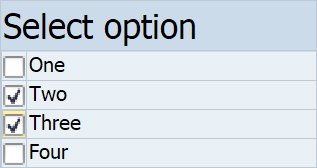 METHODS set IMPORTING options TYPE ty_options. METHODS get RETURNING VALUE(options) TYPE ty_options. DATA mo_salv TYPE REF TO cl_salv_table. METHODS on_click FOR EVENT link_click OF cl_salv_events_table IMPORTING row column sender. DATA(docker) = NEW cl_gui_docking_container( extension = 200 side = cl_gui_docking_container=>dock_at_left ). DATA o_column TYPE REF TO cl_salv_column_table. CHANGING t_table = mt_options ). o_column ?= columns->get_column( 'MARK' ). o_column ?= columns->get_column( 'ICON' ). o_column ?= columns->get_column( 'KEY' ). o_column ?= columns->get_column( 'TEXT' ). SET HANDLER on_click FOR handler. 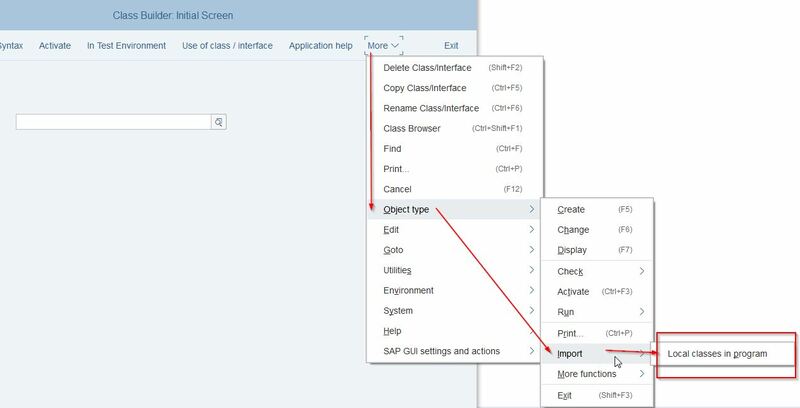 READ TABLE mt_options ASSIGNING FIELD-SYMBOL(<option>) INDEX row. APPEND INITIAL LINE TO <option>-_col_ ASSIGNING FIELD-SYMBOL(<col>). APPEND INITIAL LINE TO <option>-_col_ ASSIGNING <col>. selections->set_selected_cells( VALUE #( ) ). LOOP AT mt_options ASSIGNING FIELD-SYMBOL(<option>). 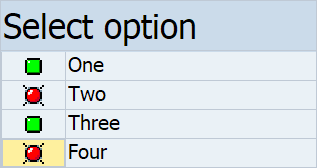 options   TYPE STANDARD TABLE OF ty_option. DATA(docker) = NEW cl_gui_docking_container( side = cl_gui_docking_container=>dock_at_left extension = 130 ). mytoolbar->set_registered_events( VALUE #( ( eventid = cl_gui_toolbar=>m_id_function_selected ) ) ). text       = CONV #( <option>-text ) ). ASSIGN options[ value = fcode ] TO FIELD-SYMBOL(<option>). I will promise to catch up on this! Nice work and always good to see that others also have to solve such problems. Only question left. Why local classes? I do not see any advantage of using it…. No matter if just used in one application or not. Local classes because I can write and test it very easily in one report. CTRL-A + CTRL-C in the web and CTRL-V in your editor and you can test once in a second in your system. Heyhey, I’m with you and can understand that for testing and publishing purpose a local class is a good isntrument. thanks great blog to #currentWorldsChallenges we face right now. Will try these option in the next classic Report.